Salaries and pensions in Greece are paid according to a 14-payment system implemented in 1945 by the Ministry of Labor, following the end of Nazi occupation. As explained in “Examples of jobs and salaries in Athens, Greece,” a normal annual salary is divided into 14 equal portions that consist of 12 monthly payments, plus a full month’s payment at Christmas and two half payments at Easter and summer. Paying salaries in this alternative way helps to ensure that households have money for important holidays, lowering the monthly salary year round and serving as a forced savings account that comes available when extra expenses are incurred. Other European countries, such as Austria, Portugal and Spain, also have 14-payment schedules. It is not unique to Greece. Citizens from countries with a 12-payment system, anyone misinterpreting the word ‘doro’ or gift, and English-language media mistranslating or referring to the doro as a ‘bonus’ or ‘extra salary’ all contribute to popular misconceptions that payments at Easter, summer and Christmas are gratuitous. They are not extra salaries, additional paychecks or bonuses. The second round of austerity measures from May 2010 that eliminated or reduced the 13th and 14th salaries were, in fact, 10-30 percent pay cuts to pensions and annual salaries. Behind the scenes in 2011, many employers gave workers the choice of having their salaries cut and withheld or being fired. In 2011 and 2012, more than 60 percent of people admitted that they will use their ‘doro’ to pay existing debts and expenses, or do not want to spend money on gifts, fearing that they or a family member will soon be unemployed. Less than 15 percent of the doro would be allocated for holiday gifts or entertainment, a sharp drop from 2009 when the percentage was 46 percent. Who is entitled to receive a Christmas doro? Part-time or full-time salaried employees in the private or public sector with indefinite or fixed-term contracts are eligible to receive a full or pro-rated Christmas doro, as long as they were legally employed between May 1 to December 31 that year. Unemployed persons who worked anytime from May 1 to December 31 before voluntarily quitting or being dismissed are entitled to collect a portion of their Christmas doro from their ex-employer, in addition to whatever unemployment benefits they receive. Self-employed entrepreneurs, business owners, freelancers and uninsured/illegal workers do not receive a Christmas, Easter or summer doro. Austerity measures passed May 2010 restrict certain salaried employees and pensioners from collecting the Christmas doro in part or in full. In cases where a person has more than one Greek pension, the higher pension is used to determine eligibility. • Retirees over the age of 60 and collecting a gross monthly payment of less than 2500 euros from any Greek insurance fund are entitled to a flat-rate Christmas doro of 400 euros. • Retirees over the age of 60 and collecting a gross monthly payment of 2500 euros or more from any Greek insurance fund are NOT entitled to a Christmas doro. — a pensioner collecting benefits outside an insurance fund. However, with austerity and reform to the pension system from 2010-2014, most retirees no longer receive a Christmas doro. • Public sector employees earning a gross monthly salary of less than 3000 euros are entitled to a flat-rate Christmas doro of 500 euros. • Public sector employees earning a gross monthly salary of 3000 euros or more are NOT entitled to a Christmas doro. New austerity measures eliminated the 13th and 14th payment on January 1, 2013 for all civil servants, whose salaries will be determined and tracked by a single payroll system. For low-income pensioners of all funds except OGA, the Greek government also approved a supplemental payment of 100-300 euros from EKAS in 2010. Retirees must be at least 60 years of age as of November 30, 2011 and have (ideally) filed a tax return in 2009 for the year 2008 as proof of meeting income requirements listed below. 100 euros: Individuals declaring a gross annual income of 8,501–10,500 euros, or total household income of 14,501–16,500. 200 euros: Individuals declaring a gross annual income of 7,001–8,500 euros; or total household income of 12,001–14,500 euros. 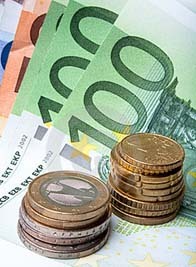 300 euros: Individuals declaring a gross annual income up to 7,000 euros; or total household income up to 12,000 euros. Financial assistance payments from EKAS are tax-exempt. How is the Christmas doro calculated? c) Rate of pay up to December 10 of that year. A pay raise awarded after December 10 is not taken into account even though the period lasts until December 31; and the rate of pay on the date of departure is used if the employee quit or was terminated before December 10. Calculation of the Christmas doro is based on regularly earned or periodically repeated wages and other benefits and allowances for an average of 25 days work that form part of the normal monthly salary. This would include legal holiday and/or vacation pay; food, housing and travel allowances; bonuses for productivity efficiency; regular work hours in which the employee earns Sunday or overtime pay; tips given to the employee by customers or clients. According to the Κέντρο Πληροφόρησης Εργαζομένων & Ανέργων/Kentro Pliroforisis Ergazomenon & Anergon (ΚΕΠΕΑ/KEPEA), or Employee and Unemployment Information Center, a full Christmas doro is calculated using the gross (not net) monthly salary multiplied by 1.041666. For example, 900 euros x 1.041666 = 938 euros. For those entitled to a partial doro, the calculation is 2/25 of the monthly wage, or two days pay, for every 19 calendar days of employment or a fraction thereof. Christmas doro payments are taxed, and social insurance contributions for this holiday payment appear as an entry separate from regular monthly payments on your printout. *Please consult an adept accountant or epitheorisi employee to determine the correct calculation of a partial Christmas doro. I will not be able to assist you, nor do I encourage people to disclose private details such as salaries. • Absence allowed by the insurer, in case of illness. In these uncertain economic times, it is also appropriate to mention that an employee’s Christmas doro is reduced if a business or company shuts down permanently or temporarily anytime from May 1 to December 31. According to Eleftherotypia, the doro is reduced by half if a company closed for a period more than one month but not longer than two months; and reduced by two-thirds if the business shut down for more than two months. However, it does not apply to businesses that closed a physical location and employees continue(d) to render services, nor does it apply to seasonal businesses. Taxi drivers receive a Christmas doro from mid-December to early January, charging a fixed fee per ride (usually 1 euro) set by the union in conjunction with the Ministry of Transport. In 2009 and 2010, taxi drivers decided to forgo the Christmas doro to show solidarity and sympathy. Food servers, bartenders and hair dressers get a Christmas doro based on estimated, average earnings. It also depends on the business and/or what contractual agreement is signed between the employee and employer. *I have no first-hand knowledge in this category, so questions should be directed at an accountant or epitheorisi employee. When is the Christmas doro paid? Funds set dates independent from the other, but the Christmas doro should not be paid later than December 21. When the doro is not paid by December 21 and an employee files a complaint, KEPEA says the absolute latest date for an employer to pay is December 31. There are deviations if the date falls on a weekend or, in the age of austerity and bankruptcy, delays due to funding issues. An employer can pay earlier, if desired. The doro should be paid in cash, via bank transfer or money in hand. Employers cannot substitute gifts, company shares, vacation or compensatory time-off from work, etc. What if my employer does not pay the Christmas doro? You must file a complaint by December 31. In 2011, there was a five-fold increase in the number of complaints lodged by employees, with 1,545 total from 763 different companies who did not pay the doro on time or at all. In 2010, five in 100 workers filed complaints. Some companies gave a doro of only 250-300 euros and were pressuring employees to sign a paper saying they received 800-900 euros or else be fired. The labor board suspects that the actual number of workers not receiving a doro is 10 times higher. Paying the Christmas doro is a lawful obligation, not an option. Non-payment, late payment or paying less money than owed is considered a criminal offense, punishable with penalties up to six (6) months imprisonment and a fine, which cannot be less than 25 percent or more than 50 percent of the amount in dispute. Employees are required to file an official complaint in Greek with Ministry of Labor authorities, local police (usually in rural areas) or professional workers’ organizations. The process is not incredibly difficult but is an article in itself. Most complaints are resolved fairly quickly and in favor of the worker. However, many workers are afraid to file for fear of losing their jobs, which has increased as the economic crisis in Greece deepens. The first step is confronting your employer, which is what authorities request you do before documenting a full account of your complaint. If you have done this and there was no resolution, please leave a comment and I will help you. Please note that I made every effort to be meticulous in my research, even though some of the bureaucratic vocabulary was difficult to translate. Corrections welcome. — Personal experience with OAEE (formerly TEBE), OAED, IKA; shared experiences from friends who are employees and employers, taxi drivers, bartenders, professional soldiers, business owners. Can someone help me out please. My wife and I have been living here permanently for 3 years now, and we have full time jobs in the summer, and both of us collect OAED payments in the winter, including the Christmas and Easter bonus etc. However, we have now heard from a couple of Greek colleagues that we work with, that our employer should also pay us a bonus at Christmas. Can someone please tell me if this is in fact correct, and if so, where do we stand legally in demanding this form them? I would say we have worked 3 summers now, so would this make us entitled to 3 payouts, if in fact this is correct. Any help or advice would be appreciated. Thanks for you time if you answer this query. There is a Christmas doro every year, as long as you qualify for the payment as explained above. My article was created to fill a gap and answer readers’ inquiries, past and present. First, I must thank you for the website. It has been the most reliable source of information for me since I came to Greece one year ago. You are great! I have a question about Christmas doro. I work as a researcher at the University, and I pay the insurance myself- OAEE. I was wondering is it possible that I will also receive something this year? Thank you once again and kales giortes! Hi Kat – I hope you’re having a most wonderful holiday season. Thanks so much for posting, there’s a lot of confusion around the 14-payment system and this will help me better articulate how it works as it often leads to a noisy debate (read, argument LOL). Cheers, all the best, and love you on twitter! Hi Tina, nice to see you again! I understand from a few different readers’ comments that information on this website settles arguments with a simple forwarded link. Glad to be of service 😉 And yes, Twitter helps me stay connected to all of you on a daily basis. Lots of good info and mojo. All best and Merry Christmas. Hello Kat! This is a great article, good work! The best part for me was clearing up that notion that people receive “an extra 13th and 14th salary”, you straightened that point out clear and easy. Thank you for all the informative work you’re doing and merry christmas! I tried explaining it in a past Guardian commentary, but people were too busy bashing me to hear the informative bits (though a known correspondent did plagiarize those bits). Also noticed that no one else had a Christmas doro article in English, so I thought it was about time. Always nice to be appreciated, and thank YOU for your kind words, support and longtime readership. Merry Christmas, BB! Thanks for putting together what is, I believe, the single most informative site for Greece expat-related information. I write to ask you about health insurance in Greece. My wife and I are considering moving to Greece. Although British (and currently living in the US) we probably won’t be working in Greece and won’t be of retirement age so we would not be eligible for IKA health care/insurance after, I believe, the first year of our residence in Greece. In any case, it would appear from various posts of yours that the public health system is to be avoided? So, it seems some sort of health insurance would be a must. If so, do you have any idea of the types of costs involved for, say, a bottom of the range plan, and middle-range plan? Somewhere on your site I think you mention 250 Euros a month: would that be the going rate? Thanks in advance for any information you may be able to offer. Note: Answered privately via Twitter. I am particularly interested in the arrangement regarding paying lowly paid pensioners for Xmas 2009, I understand that are 3 categories which are paid 100, 200, or 300 euros depending on their total income decared for tax. Can someone out there help me. The supplement was approved for 2010, not 2009. If you were eligible to receive the supplementary payment from EKAS, it should have been automatically included in your Greek pension payment. If you are eligible and did not receive it, you must inquire with your social insurance carrier in Greece (IKA, etc.) and find out why. Like many other readers, i really appreciate your information. Regarding the Christmas doro, in the calculation of it you state 900 x 0.041666 = 938. Should it read x 1.04166. Also i have tried phoning the 15512 number but is unobtainable. I have not as yet received my christmas doro from my employer, but I have been in contact with them and they say they are going to sort it out next week. This will obviously be too late then to lodge a complaint. Is there anything else i can do if they do not pay. I gave the same information quoted by KEPEA for the calculation, which is why I said “According to…” — however, you’re correct and the edit has been made. I suppose I shouldn’t attribute them as the source any longer since theirs was wrong, but I’ll figure it out later because I’m in a hurry to leave. The 15512 number works fine. It’s only unobtainable if calling from a cell/mobile phone or a line outside Greece. Answer to your last question is in the first and last sentences of the section “Where do I file a complaint.” Waiting to the last day to ask me doesn’t leave a lot of options, but filing with Greek labor authorities is a process extending beyond December 31 under most circumstances. You didn’t provide enough information for me to give an answer specific to your situation. The best thing to do is consult directly with the epitheorisi (in Greek: Επιθεώρησης Εργασίας). Every municipality in Greece has an office, and you need to find the one nearest you, bring your work contract and all related documentation (ensima, etc. ), and consult with a staff member who will advise you on laws and your options. Hi,ive worked for my employer here in Greece for four years now, and never once has he paid me my Christmas doro, i have asked about it and he just says that he doesnt pay it. I work very long hours seven days a week from May until October. Can i ask is he obliged by law to pay it? I feel a little worried to push the matter because as you say i might well find myself unemployed next year. But i feel this year if i can i must do something about it. Regards Angie. There’s no way I can give a yes or no answer since you provided so little information. If you work under an official, legal, valid and signed full-time salaried and certified contract, and your employer pays IKA, then a Christmas/Easter/summer doro should be paid as it says in the article above. If you work without a certified contract, then he’s under no obligation to pay anything. It’s assumed you accept these conditions and therefore have no right to stake a claim or complain. There’s no way I can give you a definite answer because I don’t have a copy of your contract. Please have it examined by an accountant not connected to your employer or an epitheorisi employee. Should you have a dispute at Christmas, the epitheorisi is also the place you file a claim. All best. I work in a foreign ambassador’s residence as domestic staff. I would like to ask,what if i will resign between December 15-20 and i will file my resignation 2 months before(October),will i still receive the Christmas doro? There’s no way I can answer your question with so little information. It depends the many factors — work status, type of contract, exceptions, exclusions, etc. — as listed above in ‘Who is entitled?’ and ‘How is the Christmas doro calculated?’ The date you resign is irrelevant. Also see section ‘Professions with regular but variable income.’ I state clearly that domestic staff fall in a different category and inquiries should be directed to an accountant or the epitheorisi. Where i can get information about my contract, if it is legal or not, and what kind of contract i have ? If i came for work in Greece through an agency as a student … should i get the bonus or not? OAED can give all the information about my contract : if i have ensima, if i get bonus and how much money should i get …. ?? ?